Tiger Woods had a big first round at Aronimink. Tiger Woods put on a good show for the thousands who watched him Thursday at Aronimink Golf Club on a sweltering day, as he turned the clock back and gave himself a real chance to finally break a five-year winless drought. Woods, 42, enjoying his first relatively healthy season since he played 16 tournaments in 2013, shot a blistering 6-under-par 29 on his first nine and came in with an 8-under 62 to tie Rory McIlroy for the lead after the first round of the BMW Championship, the third FedExCup playoff event. Woods beat his previous season best by three strokes and was one off his career low, a 61, which he has shot three times. The last 61, in 2013, came at the site of his most recent victory, the World Golf Championship Bridgestone Invitational. 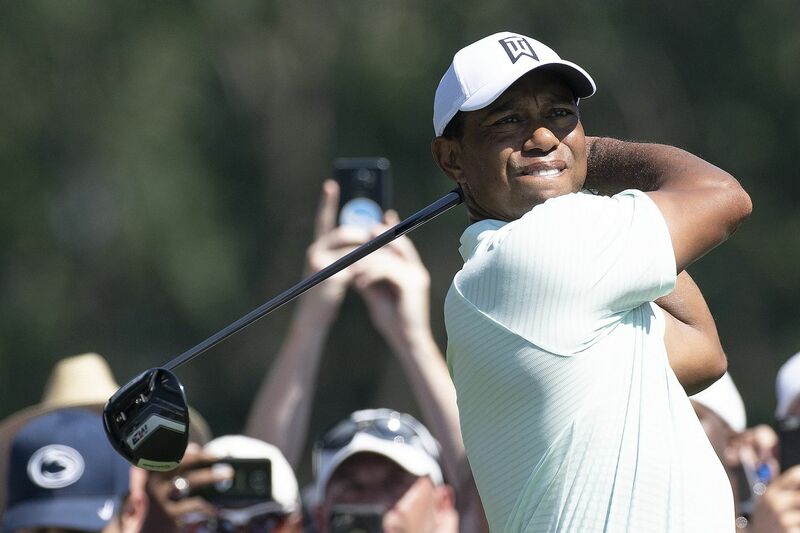 The fans who saw Woods left Newtown Square with a smile on their faces. Even McIlroy had to smile. "As I've said, we all benefit when Tiger Woods is playing well," he said. "I'm happy he's up there and it'll be a great tournament if he stays up there." If he can match Thursday's ball-striking and putting, Woods has a great chance of staying there. Starting on the back nine, he hit 16 greens in regulation and carded an eagle and seven birdies. His one bad swing of the day came at the par-3 eighth where he went long and left and made bogey, but he finished with a 7-foot birdie putt at the par-5 ninth. Aronimink played firm enough that the ball rolled in wide fairways, and soft enough that the greens were holding. The scores were low – 48 of the 69 players broke par, and 11 shot 65 or lower. Xander Schauffele was alone in third place at 63 and defending FedExCup champion Justin Thomas headed a group of four at 64. The course could be softer with rain forecast for Friday, when players will tee off between 7 and 9 a.m.
"You definitely could do it today," Woods said. "The fairways are ample wide and the greens are soft. The positives right now, we're driving it down there anywhere between 310 and 340 so it's really not that long a golf course … you have to hit your wedges well, get your distance." Woods was dialed in on distances. He drained a 5-footer for eagle at No. 16 and four of his birdies were on putts of less than 10 feet. Woods was 7-under after a birdie at No. 1, his 10th hole, and the "59Watch" hashtags were out on Twitter. He had some good birdie looks on the second nine but could not convert, but he was satisfied with his lowest opening round since 1999. "I hit good putts. They just didn't go in, which was fine," he said. "I can accept that. I hit putts on my line, and it drives me crazy when I wasn't doing that, but today I did." McIlroy, who also started on the back, carded 10 birdies, including six in a row from No. 18 through No. 5, to get to 9-under after 14 holes. To get an idea of how dialed in he was, his longest putt during that run was 9 feet, and his last two were 3 feet each. McIlroy admitted he was thinking of breaking 60 after his 14th hole. But he bogeyed 7 and 8, the latter with a 3-putt, before a 2-putt birdie at 9. "You don't get many opportunities to break 60 and today was one of them and I didn't capitalize," he said. "I'm not going to say it stinks too bad because I'd much rather shoot 62 today and win the golf tournament Sunday than shoot 59 today and maybe not win."